We’ve all waited in line for a simple cup of coffee and been tempted by a display case full of scrumptious looking chocolate, blueberry, and banana muffins, scones, and other pastries. How many of us have given in and asked for a muffin, because that seemed like the “healthiest” choice of the bunch, because otherwise we would have had to skip breakfast altogether, and because — let’s face it — muffins for breakfast are delicious? You can’t see this, but I am raising my hand. I’ll admit, this has been me on more than one occasion. Unfortunately, most muffins are little more than cupcakes without frosting. They’re often oversized and loaded with not-so-good-for-you ingredients like refined flour, butter, or vegetable oil, lots of sugar, and — if they’re mass-produced — plenty of additives and preservatives. For anyone watching their waistline, muffins are a treat that is entirely out of reach. 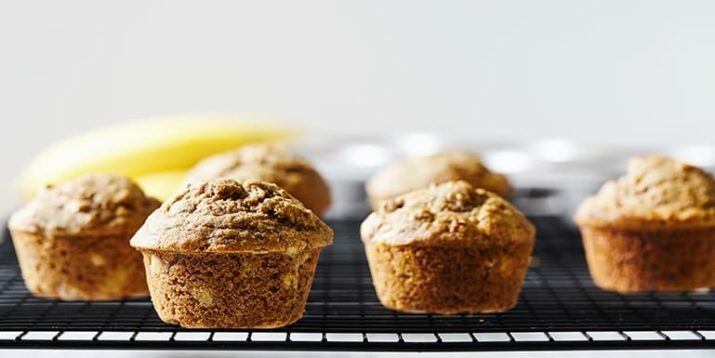 But, with a few tweaks, muffins can be made much healthier. 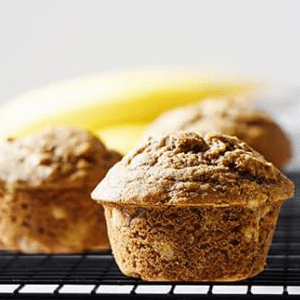 In fact, these delicious banana muffins are healthy and satisfying enough to eat for breakfast. Plus, they taste like banana bread! Whole wheat flour adds extra fiber and nutrients that white flour lacks; ripe bananas and a touch of honey add natural sweetness in place of sugar; and, because bananas are good at keeping baked goods moist, this recipe uses only a scant amount of coconut oil. If your bananas aren’t quite ripe yet, check out this post for clever tips on how to ripen bananas faster. Now let’s get baking! Prepare 12 muffin cups by lining with muffin papers or lightly coating with spray. Combine flour, baking powder, baking soda, and salt in a large bowl; mix well. Set aside. Combine egg, honey, almond milk, oil, and extract in a medium bowl; mix well. Add egg mixture to flour mixture; mix until just blended. Evenly divide batter among prepared muffin cups. Bake 18 to 23 minutes, or until tester inserted into the center comes out clean. Transfer muffins to rack; cool.